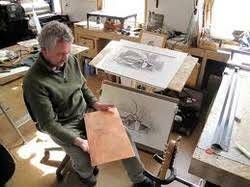 Franc van Oort demonstrates copper plate printing. Franc van Oort was born in Soest, Holland, in 1953, into a long line of artists. Among his forefathers are a master printer, a political cartoonist, and his father, an author and illustrator of children’s books. As a boy, he had a fascination for illustrations and prints, which were abundant in his environment. He was especially inspired by a large retrospective exhibition of M.C. Escher’s work, and amazed at the effect these pictures had on him. As young man, Franc was encouraged by his family and his highschool art teacher to pursue his artistic inclinations. From 1972-1975 Franc attended the Gerrit Rietveld Academy in Amsterdam, where he earned a teaching degree. Shortly afterwards, Franc met his future wife Sylvia, whom he followed to Canada, taking printmaking courses at Concordia in Montreal, and depicting new and interesting scenery. Returning to Holland he took a job teaching art at his old high school. After two years however, he decided that teaching was not his calling, and turned his attention to illustrating, watercolour painting, and etching. After a few years of frequent exhibitions and appearances at art and craft shows around Holland, Franc and his family, meanwhile augmented with daughter Linda and son Marcel, emigrated to Canada in 1985. Happy in his newly adopted country, Franc enjoyed the open spaces, relaxed atmosphere, and ready subject matter. Continuing to establish himself as an artist, Franc spent many years attending craft shows in Ottawa, Kingston, and Toronto, and exhibiting his work in numerous solo and group exhibitions in galleries across Ontario. Far from slowing down, Franc continues to add to his oeuvre of over three hundred etchings, remaining as enthusiastic as ever about his art.